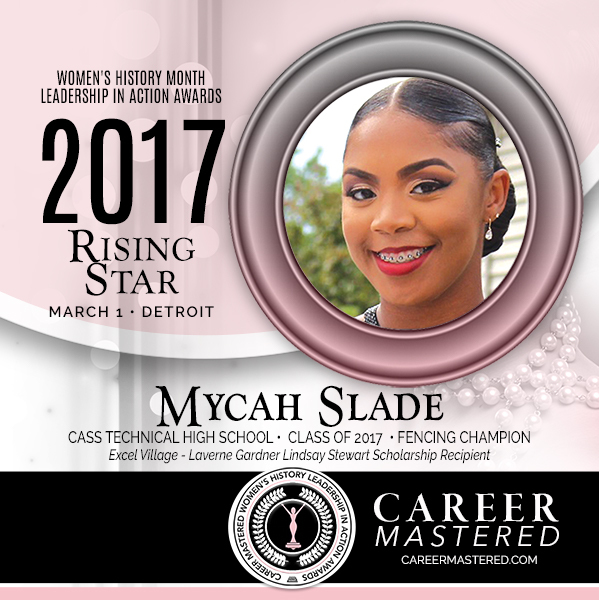 Detroit, USA, November 29, 2017	(Newswire.com) - Mycah Slade, Cass Tech High School Honor School Graduate received the LaVerne Gardner Lindsay Stewart Scholarship during the 2017 Career Mastered Women's History Leadership in Action Awards at The Henry Hotel in Dearborn, Ml. She also received the 2017 Career Mastered Rising-Star Award. A freshman at Wayne State University, Mycah has her sites set on the 2020 Olympics as the First African American Fencer from Michigan. The Board and Trustees of Excel Village Center for Learning is pleased to award $1,000 to Mycah Slade says Dr. Lisa J Lindsay Wicker, Board Chair and Founder of Excel Village. “Mycah represents the essence of the late LaVerne Gardner Lindsay Stewart’s life of positive choices, unfailing hope, useful gifts, educational honors and integrity.” Our Board of Trustees is pleased to award this scholarship in conjunction with our corporate sponsor, Fifth Third Bank. It is about the next generation and what we can do to ensure their winning futures. The LaVerne Gardner Lindsay Stewart Scholarship is awarded to a promising rising star students during the Annual Career Mastered Awards, the leading Women’s History Month Award Program honoring today’s women leaders who are Game Changers who take charge of their careers and their futures. The Scholarship is awarded to the most promising students who show great academic or entrepreneurial potential. The late LaVerne Gardner Lindsay Stewart was an Author and Poet who graduated with honors and penned her class song in 1944. Excel Village Center for Learning is a 501c3 non-profit organization whose mission is to create winning futures and careers in community areas most needed at the elementary, junior-high and high school level. The organization offers an evidenced-based life-skills curriculum to aid in the implementation of winning futures and careers. Programs include Life-Skills Curriculum, Career Mastered Rising Star Award, Mentoring, and Excel Honors Awards. All donations are tax deductible. Source: Linwick & Associates, LLC.